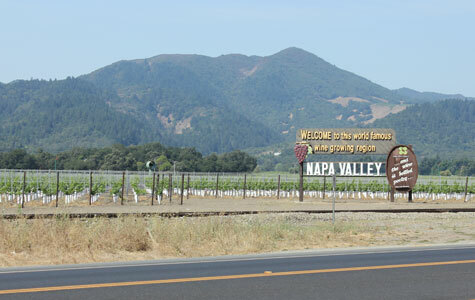 When it comes to the best wine regions in the world Napa Valley certainly is a top contender. 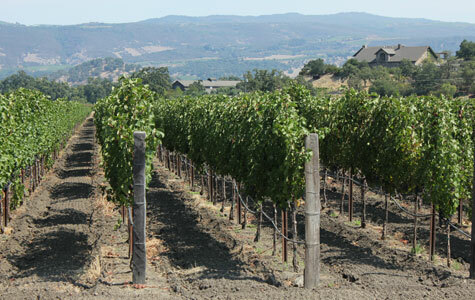 You can find big names like Chandon, Robert Mondavi and Beringer in the region, amazing dining and sumptuous accommodations to retreat back to after you’ve sipped and tasted all day long. 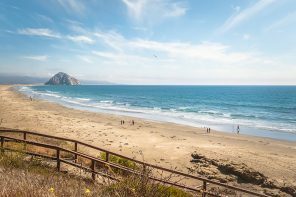 While we didn’t get to spend as much time as we would have liked, we can definitely say it’s a destination worth returning to. 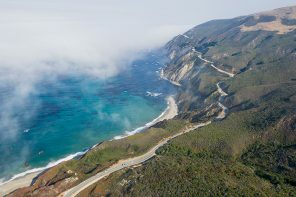 If you have some energy to spare and a love of adventure we highly recommend taking a bike tour. We decided to go 100% DIY and rent bikes with Napa Valley Bike Tours (although next time we would have opted for self-guided tour that included wine pick-up — our pannier was heavy by the end!). The service here was great — very friendly — and we got some great tips on places to stop along the way. Coming from San Francisco earlier that morning, we got a little bit of a late start to the day and would suggest starting to bike the road around 10am. This will allow you to bike leisurely and stop off at 4-5 places, depending on if you just opt for a tasting or want a tour too. We opted for the easy route that would allow us to get about four stops in (plus lunch!) before we had to return our bikes at 5pm. Here’s how our day went down. 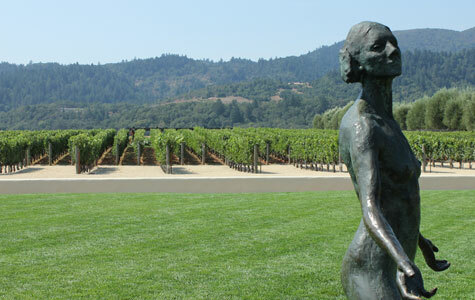 We knew we wanted to visit a big name winery and Robert Mondavi was the perfect first stop. For $25 we tasted four delicious wines, which we were able to enjoy while exploring the grounds. We opted to save time and not take the 75 minute tour, although it’s a great chance to learn more about the wine making process, as well as get a lesson on tasting (great for newbies!). Just be sure to make a reservation ahead of time to avoid being disappointed. 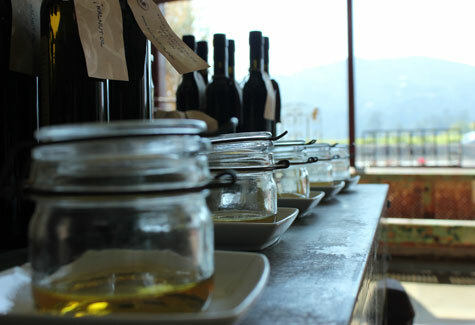 Stop #2 – St. Helena Olive Oil Co.
Tasting jars of olive oil at St. Helena Olive Oil Co.
You didn’t think Napa Valley was only good for growing grapes did you? 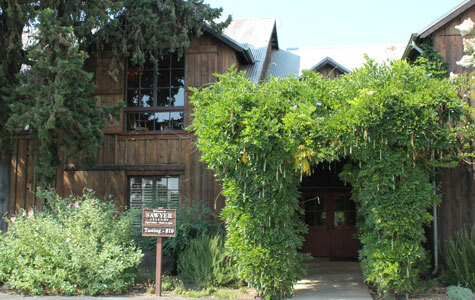 If there is one must-stop on your tour make it St. Helena Olive Oil Co. located on Highway 29 just north of Mondavi. Here you’ll be able to taste olive oil, balsamic vinaigrette and even jams. 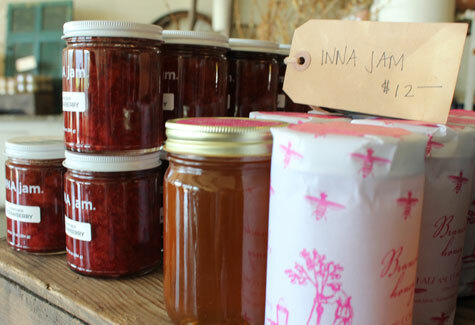 The store has an old barnyard-feel and all of the products are packaged in simple jars and bottles with vintage-style tags. In addition to the food, you’ll also find bath salts, lotions, scrubs and soaps. We fell in love with it all. Jam at St. Helena Olive Oil Co.
Two stops and we were already ready for lunch. Take a detour and opt for some real Mexican cuisine at La Luna Market & Taqueria. Here we scarfed down the best burrito we’ve ever had in our lives. For $5.25 you can get a regular-sized burrito (which is massive) and thanks to the adjoining market, a beer to help wash it all down. During our tour we wanted to balance out our visits with a smaller winery tasting and we definitely found it at Sawyer Cellars. A family-owned winery and estate, we enjoyed a three wine tastings for $10 and a friendly rundown from the gentleman at the counter. 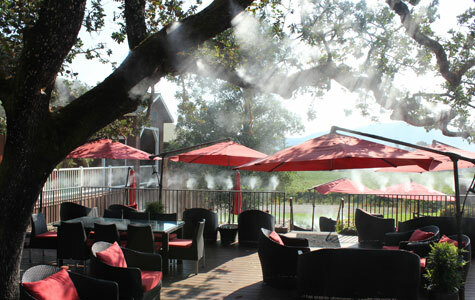 After what felt like a lot of biking, we made it to our last visit of the day — Mumm Napa. Since we’re fans of the bubbly, we wanted to make sure we popped in for a taste test. It was particularly hot the day we visited, so we opted to stay indoors, but they have a wonderful patio with gorgeous views of the vineyards and some cool misting to keep you feeling refreshed. The tastings range from $7-$25 depending on how many and of what varieties you want to try. If you love bubbles, you’ll enjoy the tasty sparkling wine here. From Mumm back to the bike shop was probably the longest bike portion of our day, so be sure to give yourselves at least an hour — maybe even an hour-and-a-half if you need to bike slowly. Chances are after a long day of tasting wines you’re energy levels (and biking skills) may have dipped. Plan to retreat back to your hotel for room service (we did!) — you’ve totally earned it. All photography courtesy Kyle Wilson.